Of all the various Hard Case Crimes I’ve read, a handful of authors jumped to high spots on my to-buy list, and Wade Miller was the highest of those. I read Branded Woman four years ago, which I found very impressive, and it’s taken me this long to track down more of his novels. I should say their novels, because Wade Miller was the impressive writing duo of Robert Wade and William Miller; under one name, they penned a fine body of works that hasn’t yet received the reprint attention it deserves, besides one double from Stark House (which includes this one, The Killer, and Devil On Two Sticks) and the aforementioned Hard Case (Branded Woman). Gold Medal 521 – 1955 – C.C. Beall. 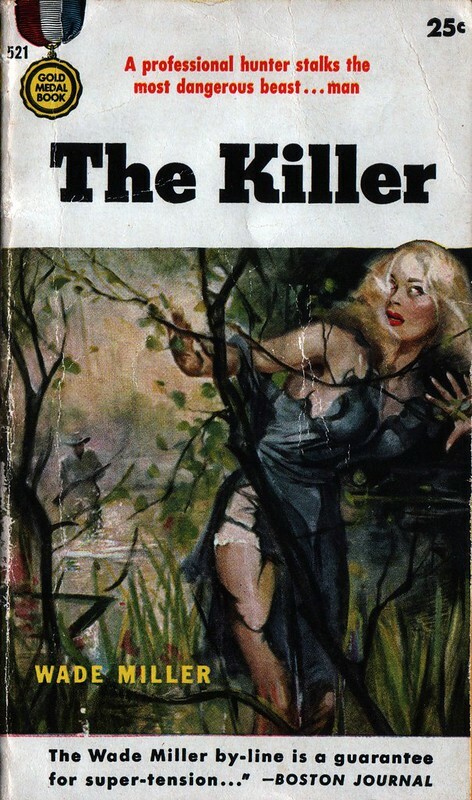 Fourth printing; a cropped version of the original painting, with Farrow stalking one of the novel’s femme fatales through the Georgia swamps. Jacob Farrow, safari guide to big-game hunters, is stuck lounging around his Kenyan villa after a bad decision lost him his license. So when a young lawyer to a mysterious client shows up and requisitions his talents to hunt unspecified game on another continent, Farrow takes the oppertunity. It turns out his new employer is a former client named Stennis, a hunter he leads on safari every year; Stennis is a bank-owner whose son died during a robbery by the famed Clel Bocock and his group of bank-robbing ruffians. And this grieving father wants Farrow to find Bocock and kill him: a new spin on the term manhunt. Of course, the police are having a hard time tracking Bocock already, but Farrow’s too prideful to walk away from a hunt or back down from a job. His hunt will take him across America: from the Georgia swamps to the Chicago rail-yards, to the Midwestern jail of some overzealous sheriffs, and beyond, heading further and further West to catch his quarry. Along the way, he runs into two strong femme fatales. The first, and more important, is the killer’s wife: Marget Bocock. She grew up with Bocock and married up right before his crime spree, and is trying to reconcile her love for him and wifely duties with her disapproval (and fear) of his new career choices. Next up is Terese Tyler, a secretive contact who turns out to be Bocock’s other dame, who becomes much more important once she enters the picture in full. Both have ties to Sam Augustine, the shrewd fence who becomes Farrow’s immediate problem and recurring antagonist. Gold Medal 810 – 1958 – artist unknown. Eighth printing, which gives us a new version of the original’s “tracking a woman in a swamp” art. Speaking of characters, they start a little on the flat side, but end up very developed. Farrow is very single-minded; he’s in this for the thrill of the hunt, and that’s about it. Money, fear, life and death, even love come second-place to his hunt instinct. At least until he sees human death first-hand and falls in love with Marget, and becomes queasy, questioning his role as hired killer. His relationships with the other characters—Marget in specific—make for interesting developments, and the finale is richer because of it. Marget is more rounded, somewhat independent and headstrong, though she’s stuck in a “1950s female” role. Most ’50s noir novels have a hint of misogyny, reflecting the ideas and ideals of the time; this one is no different. (It gives them a time-capsule feel, and the vibe of watching an old ’50s movie in an old ’50s theater.) Marget knows how to handle a gun (growing up in the alligator-filled swamps and all), and she’s fiercely independent, but she spends a lot of time explaining how she won’t give Bocock away because she wants to be the proper wife. And she’s also kind of a loose woman, deep in love with Bocock while having strong feelings immediately upon meeting Farrow. Both female characters are very emotional, and driven by their passions: Marget for the men she loves, which is something of a crossroads tearing at her conscience, and Terese for cold, hard cash. Wade Miller’s writing isn’t fancy or unique, though it does convey tension like nobody’s business, laced with artful prose. That comes across best in the evocative setting description; each locale feels like the place it’s set in, accomplished by including numerous but minute details. The plot is a straightforward mystery in that its developments neither surprising nor random; they feel natural and not like surprise twists, making the novel more of a noir adventure tale than a hardboiled crime caper. Coming right off some breakneck and byzantine noir novels, Wade Miller’s The Killer has a more rational pacing, and generates just as much tension. This isn’t the first time I’ve seen the “big-game hunter performs man-hunt” plot in action, though I can’t remember where the last time I saw it was. Gold Medal 152 – 1951 – C.C. Beall. First printing, which shows the full spectrum of the Georgia swamps. There’s a lot to like about The Killer. The action is credible; the characters are interesting; the plot engaging and tense without being speedy or over-complicated; the writing is solid if not exceptional. The final showdown is a striking scene, and the many moments that build up to it are brilliant. Most of all, I found it a damn fun book to read. Entertainment/enjoyment value out to count for something, right? The Killer has a few aspects I wish it were stronger at, but I still think it’s a solid, respectable novel that many vintage mystery readers will find engaging and thrilling. Make no bones about it, this is a fine book. Not every Gold Medal was a routine murder-mystery or tied-and-true hardboiled detective fare. Some, like this one, stand above the crowd and excel. If you’re trying to get into vintage ’50s crime-noir novels, Wade Miller is an excellent starting point, and The Killer is just shy of fantastic. This is why some reprint house or another needs to find Wade Miller books and reprint all of them; they’re damn good. While I have one more, Stolen Woman, to read, I’m redoubling my efforts to track down Wade Miller novels. I have read a few Wade Miller novels that I was lucky to fine, I thought they were pretty good and something to read on a rainy day.